The Mercedes-Benz E-Class is a four-door, five passenger luxury sedan, and a four-door, seven passenger luxury wagon. While the range of vehicles represented by the Mercedes-Benz E-Class dates back over 50 years, the actual use of the vehicle name did not become official until the mid-1980’s. The E-Class slotted in as Mercedes’ mid-size luxury and family vehicle, offered in both a wagon and a sedan body style. The second generation E-Class released in 1995 helped to solidify the place of the company in the hearts of North American consumers, and the E-Class has been a strong seller ever since. The 2008 Mercedes-Benz E-Class is a competitor to the BMW 5-Series in the German mid-size market. There are several different trims and engine choices available for the E-Class, making it one of the most diverse models in the Mercedes-Benz lineup. The entry level sedan is the E350 which is powered by a 268 horsepower, 3.5-liter V-6. 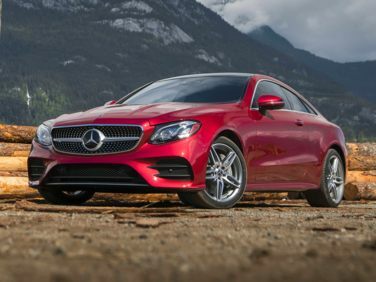 The next step up is the E320 BlueTEC which makes use of Mercedes’ 3.0-liter turbo-diesel to generate 210 horsepower and 400 lb-ft of torque and is still able to meet federal pollution regulations for vehicle emissions. For those interested in having a V8 engine installed under the hood of their Mercedes-Benz, the E550 does not disappoint. The 5.5 liter engine found in this model produces 382 horsepower, but if even this is not enough, then a shocking 507 horsepower E63 AMG can be ordered for around $20,000 more. The E350 and E63 are also available as station wagons, but only the E350 and E550 are available with Mercedes' 4MATIC all-wheel drive system. With so many possibilities available, it might be hard to decide which version of the E-Class suits you the best. The wagon provides acres of storage, almost matching the much larger M-Class SUV in terms of cargo space. A rear-facing third-row seat that folds up from the floor can also be found in the wagon, although this non-standard seating position is best left to small children. All versions of the E-Class feature a user-friendly intuitive dashboard that makes excellent use of a mix of analog and digital gauges. Controls for the dual-climate control are logical, and an optional surround sound system from Harman/Kardon will keep driver and passengers entertained whether they are watching a DVD or listening to music. The fuel mileage of the diesel engine is impressive for a vehicle of this size – 32 miles per gallon on the highway, and 23 in town – and with all of that torque, it is unlikely that drivers will feel as though they are missing out on any performance. Those with a heavy right foot who opt for the E550 will definitely feel a bit of a pinch at the gas pump, as it turns in a much more pedestrian 15 miles per gallon in stop and go traffic and only 22 in highway cruising. Of course, for most people shopping for a German V8-powered luxury car, fuel mileage is not a primary concern. Since the E-Class would seem to offer the best of both worlds in terms of horsepower and performance, it is likely that even the most demanding buyer will be able to find a version of this sedan or wagon that suits their needs. The 2009 Mercedes-Benz E-Class is a carryover from 2008. The 2009 E-Class is offered in both sedan and wagon form, with the sedan featuring four trim levels and the wagon coming in two. Both start out with the E350, which makes use of a 268 horsepower, 3.5 liter V6 engine that also produces 258 lb-ft of torque. A 7-speed automatic transmission is standard equipment on the sedan, unless all-wheel drive is ordered, in which case a 5-speed unit is substituted. The E350 wagon comes exclusively with all-wheel drive. Fuel economy is rated at 17 miles per gallon in the city and 24 miles per gallon on the highway for the rear-wheel drive sedan, with the heavier all-wheel drive sedan and wagon showing slightly greater fuel consumption. The E550 sedan throws a 382 horsepower V8 into the mix. Also capable of generating 391 lb-ft of torque, the E550’s engine features the same transmission options as the E350: a 7-speed auto for rear-wheel drive cars and a 5-speed for all-wheel drive 4MATIC editions. Fuel economy for the E550 shows as 15 miles per gallon around town and 22 miles per gallon on the highway for rear-wheel drive models. A diesel version of the sedan is also available. Dubbed the E320, it features a 3.0 liter diesel V6 that makes 210 horsepower and a generous 400 lb-ft of torque and it also uses a 7-speed automatic transmission. Fuel economy is a respectable 23 miles per gallon in city driving and 32 miles per gallon during highway cruising. There is a performance edition of both the sedan and wagon, known as the C63 AMG. It uses a 7-speed transmission mated to a 6.2 liter V8 engine tuned to provide 507 horsepower and 465 lb-ft of torque. Fuel economy shrinks to 13 miles per gallon around town and 20 miles per gallon on the highway.